Welcome to my Drift Ghost X review! What’s so special about this small action camera and who is it for? Is it worth buying the Drift Ghost X? 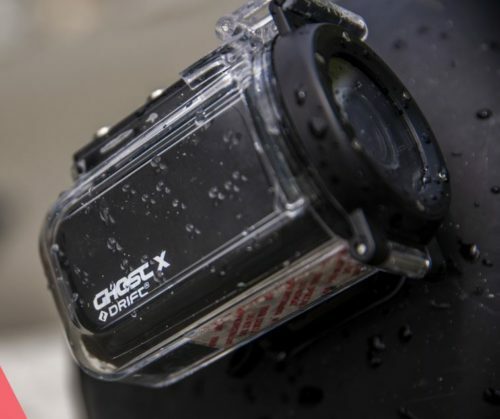 The Ghost X is the lightest and cheapest model in the Drift action cameras. It provides max 1080p at 30 frames per second video resolution. Yes, I know what you are thinking.. Only 1080p? Well its price is very competitive and it is one of the reasons this camera goes only to 1080p. I guess Drift Innovation wanted to provide their customers who cannot afford to buy the 4K model with a cheaper option. If you’re looking for a 4K action camera from Drift then you can always check the Drift Ghost 4K. If you are on a budget, this Ghost X can be a great option instead of the other Chinese action cams you find in the market. In this review, I will cover as much information as possible on this Ghost X and will take you through every detail like un-boxing, design, features, resolutions and video/photo quality and more. Drift claims that the Ghost X has a long battery life, 12MP still shots and high quality low light performance. What do you think of these claims? So in the box, you will find the Ghost X camera obviously. A quick start guide, a small box with some accessories and mounts and some stickers. In the small box, there is an external microphone adapter. It’s the small micro USB to 3.5mm jack female plug. A USB cable for charging is also included and two adhesive mounts. One with a flat base and the other with a curved base which is used for helmets. They also included what it looks like the small SIM remover, it is used to reset the camera to factory settings. There is no waterproof case included in the box, so this one will have to be ordered separately. I had a look at the Drift website and I saw a variety of optional mounts and accessories like handle bar mounts, suction cup mounts, head strap, remote control and more. Unlike the other cheap action cams like the Apeman A80 which includes many accessories in the box, the Ghost X doesn’t. Same as owning a GoPro, you need to buy any additional accessories separately. The Ghost X itself has a tiny form factor and it is about the same size as the palm of your hand. It’s rubbery body makes it harder to slip out of your hand and also makes it water-resistant, but not waterproof though. Based on few users reviews, this camera cannot be used in the rain without the waterproof case. It will be damaged. At the front, you have the 300 degrees lens. If you need to mount the camera sideways or upside down or even diagonally, then you can just rotate the lens until the white arrow mark is pointing upwards. You might notice that the lens might feels a bit loose. But it really is firm, it won’t move by itself. At the back, you have a tiny screen. The color indicates which mode the camera is in. The WiFi/left arrow can be used to toggle between the different modes. The green color means that the camera is in Video Mode. The orange color is for Photo Mode. The Purple is for Time-Lapse Photo Mode. The light blue is for Burst Mode. And the blue color for the Settings Menu. One one side, there is a tripod mount that can be turned into any direction you want. The screw can be un-tightened which allows you to set the pivot you want on it in relation to the camera. Once set, you can then tighten the screw with your fingers. Now on the other side of the camera is the battery. This battery has a capacity of 2000mAh and can last up to 5 hours. If 5 hours are not enough, then there is an optional battery offered by Drift that can last up to 8 hours. At the top of the camera, there are three buttons. These are large compared to the other Drift models which are easier to press. The right button is the Power and right arrow button, it is used to power on/off the camera. The middle button is the up/down navigation button. The left button with WiFi/left logo is used to switch between modes. At the bottom, there are two rubber flaps. Under one of the flaps, there is the micro SD card slot, the Ghost X supports cards up to 128GB. And just under the micro SD slot is a tiny hole: the Reset button. Under the other flap, there’s the micro USB port used for charging, PC connection for data transfer and for connecting an external microphone. The cameras’ two microphones are also at the bottom, one at the front and the other at the back. There is no HDMI output on this camera, so not possible to capture videos using a capture card or connecting it to a large TV. The Drift Ghost X can shoot videos in full HD so 1080p at 30 frames per second and 25 fps. The other resolutions are 720p at 60/50/30/25 fps and WVGA at 60/50/30/25 fps. It also provides image stabilization in all resolutions for a smoother video while riding. No 120 frames per second here, so it can’t be used to shoot slow motion videos. However, the Omnivision OV4689 image sensor can handle 1080p at 120fps and 720 at 180fps. The Ambarella A12 chipset supports resolutions up to 1080p at 60 frames per second and not higher. Ghost X has a sharp image when recording in 1080p at 30 fps, it can capture small details like plate numbers. The videos look clear and the colors are vivid. Sometimes videos can appear to be overexposed especially when you go from dark to light on a sunny day. It takes the camera a little while to adjust to the light level. It also cannot handle the highlights as well as a GoPro Hero 6 for example. I liked the quality and I find it sharp for a 1080p resolution especially in a cloudy weather so when it is not too bright or when there is not too much light. In the dark, the Ghost X out performs the previous Drift cameras like the S.
The camera picks up light pretty well at night, the video quality detail is not bad at all. Of course compared to other cameras with the same price range, the X performs really well which was unexpected. There is a Low light mode in the camera settings that makes the camera absorb more light from street lamps or any light source. Street lights can appear to be a bit blueish in the footage but nothing too major or bad. Now the Ghost X is not really used for taking still shots since most of the people use it for recording videos while commuting. The 12 megapixels photo quality delivers good photos, colors are vivid, details are there and photos are not very overexposed. Like the video quality, taking still shots during the day and night is fine, as long it is not too bright or too dark. But all in all, I liked the photo quality this tiny camera can deliver. The Ghost X has four modes: Video, Photo, Time-lapse Photo and Burst. 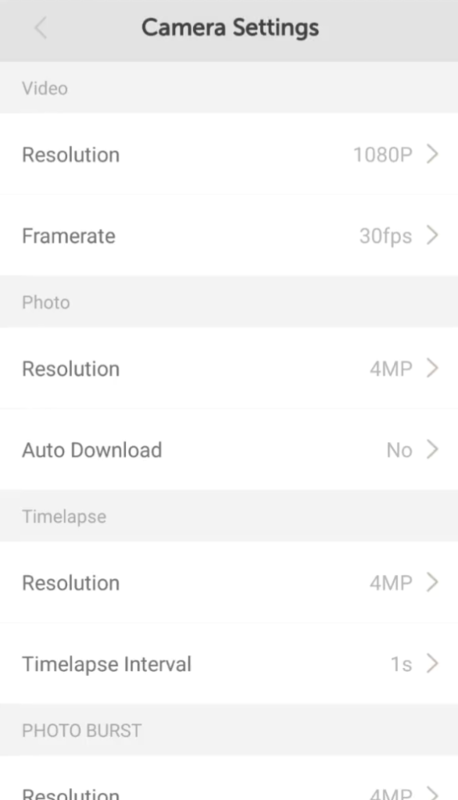 Under the Video settings, there is Resolutions and Frame Rates. Under Photo settings, there is ‘Resolution’ and ‘Auto Download’ (if on, it auto downloads photos automatically to your smartphone). Photo resolution can be set at 12MP as the highest settings and can go as low as 4MP. Under Timelapse, there is also ‘Resolution’ and ‘Timelapse Interval’ which can be set to 1S, 2S, 3S, 5S, 10S, 30S, 1MIN, 2MIN, 5MIN, 10MIN, 30MIN, 1H. Under Photo Burst, there’s ‘Resolution’ and ‘Capture rate’. For setting the shooting angle. It starts at 140 degrees as the widest setting and it can be set narrower with 115 and 90 degrees. Everyone knows what is exposure and how this settings affect the footage on your camera. The default exposure setting is 0 but it can be changed depending in the lighting situation. The bit rate on the Ghost X is around 29Mbit per second which is not bad. This can changed in the settings menu, it can be set to High, Med and Low. High is 29Mbit. Also known as Continuous Loop recording enables the camera to keep recording continuously, one video chunk after the other. The oldest video chunks will be deleted automatically once the micro SD card is full and the newest video chunks will be saved. 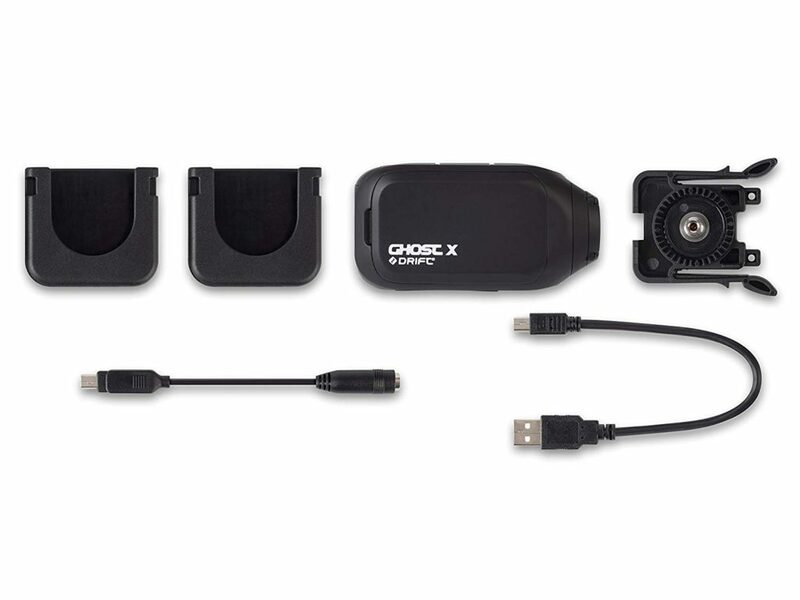 If used as a dash cam with car DVR mode on, the Ghost X will power on and start recording automatically as soon as it is supplied with power from the car adapter (12V). And it will stop recording and power off once the engine is turned off. You can choose how long the video chunks will be while recording in Car DVR mode. You have 1min, 3min, 5min, 10min or 15min intervals. One thing I noticed while recording in Car DVR Mode is that the camera will skip two seconds of recording between the video chunks. This is a really weird issue and it was also in the old Drift Stealth camera. I hope they will fix it through a firmware upgrade one day soon. Because no one wants to lose footage while using the X as a dash cam in car or on a bicycle. The Ghost X doesn’t recharge while connected to the 12V car adapter, another weird bug from Drift, which I also hope they fix in the next firmware upgrade. As mentioned earlier, the Ghost X has 2 built-in microphones at the bottom, one in the front and another in the back. I noticed that the sound quality is not that great, like most of the action cameras in the market today. The sound can be dull and a bit muffled. 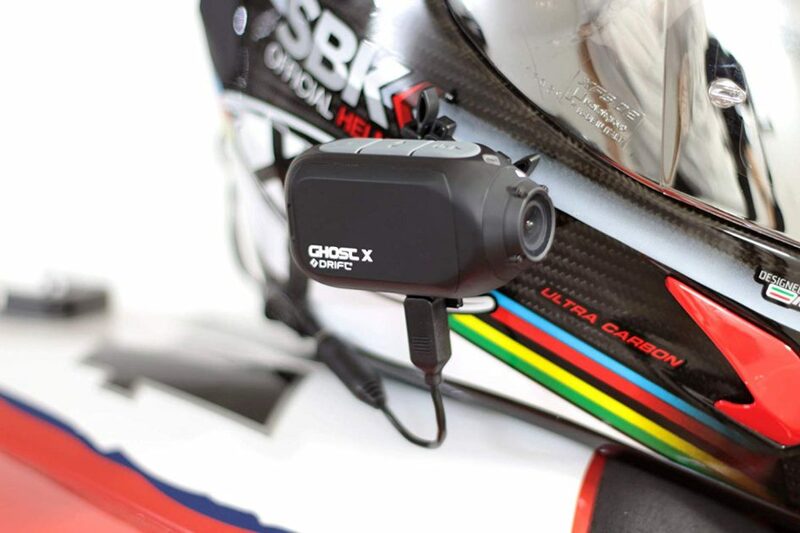 For people who will use the Ghost X on a helmet, you will definitely face issues with the wind noise when you are going at speed. So don’t expect to have the best sound quality out of this camera. It would certainly be better with an external mic, but that mic should be wind resistant. That in the camera menu, you can choose which microphone you would like to use: the front, the back or both. 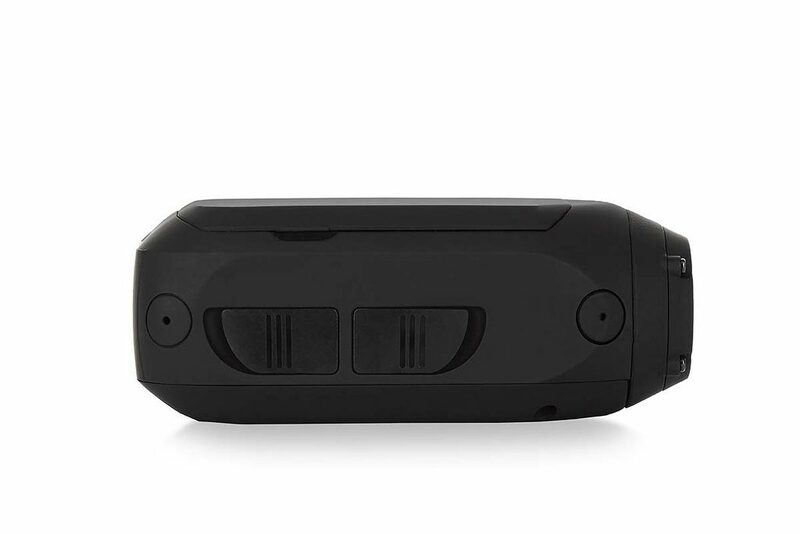 Maybe the front mic can be turned off while you’re riding a motorcycle or bicycle as it will reduce the wind noise and avoid ruining the footage. The audio really depends on the situation the camera is in. If used in car as dash cam, the sound quality would fine, still a bit muffled maybe but not too bad. Even with the sound sensitivity set to maximum, the built-in microphone quality doesn’t change much. How to connect the X to your phone? Open the app and click on ‘Connect to camera’ then choose ‘Ghost X’. The app will now as you to turn on the WiFi on the camera. To turn on the WiFi, press and hold the WiFi button. Now click ‘Next’ on the app and it will ask you to connect your phone to the camera’s WiFi. The app will show you the password. Go to your phone WiFi and connect to the Ghost X. Because of the extremely tiny back screen, it would be preferable to use the smartphone app instead. Changing settings using the tiny screen can be challenging to be honest. I prefer using my phone’s screen to change settings and resolutions. 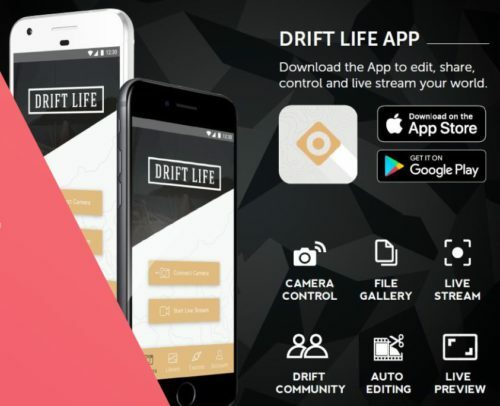 The app Drift Life is available for both Apple and Android phones and it can be downloaded from the App Store or Google Store. Everything can be managed via the app, settings like resolutions, frame rates and really everything is much easier to change. As soon as you buy the camera and connect it to you smartphone via the app. Make sure to update the Ghost X to the latest firmware. A pop up window will appear if a firmware update is available. Firmware updates are important and will fix bugs and issues with the camera, so it is recommended to always keep the firmware up to date. The Drift Ghost X is a good camera. The combination of the image sensor and chipset made it the perfect 1080p action cam. They didn’t try to sacrifice quality by pushing resolutions and frame rates up, even though the sensor can take up to 60 fps. You get good quality video footage in both day and night. I think it stands out when it comes to night time recording. I liked the fact that it has a long battery life which really helps especially while cycling or riding a motorcycle, there is no need to stop to replace the battery every hour or so. The microphones are not perfect and I’m sure they can be fixed in the next models, but they are not bad either. Looking at the price, I would say that the Ghost X is really a bargain, so you are sure to get a bang out of your buck. I hope you liked my Drift Ghost X review and found it useful.